Brooklyn –via- San Francisco’s post-punk trio Weekend released their highly-anticipated sophomore LP “Jinx” on July 23rd on Slumberland Records. 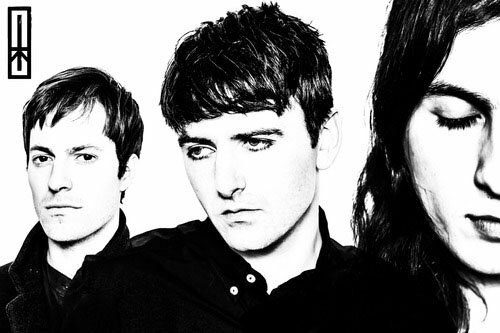 Throughout the next two years, the band found itself touring internationally with the Kills (Europe) and Wire (UK and US) and in Japan in support of the 2011's Red EP, which marked a sonic departure from the band’s initial signature addiction to noise over clarity. Red (which was also produced by Monte Vallier) saw the band embrace sweeter melodies that encouraged Shaun to display his vocal abilities free from any distortion overlap. When asked to describe the album in 3 adjectives, Durkan stated, “Volatile. Cathartic. Bittersweet. The record is a collage of inspiration and ideas from each member of the band. Shards of experiences, images, smells, sounds molded into something we can collectively call ours.” The album visually represents the music as well, through personal possessions of each band member that “had singular and emotional connections to which were then democratized through a physical process. Painting the objects black adds a new, collective ownership over the previous personal meaning. [There is] the coalescence of our individual art to make something new, stark, and powerful.” That Stark black visual sheen is compliments the songs that embody Jinx. Memories and experiences have been reinterpreted and recalled into existence from haunting, beautiful places. Each song on the album charges through a polarizing emotion through an ebb and flow of sounds both ominous and soothing. Lastly, the LP’s presumably superstitious title compliments this body of work thematically. Shaun recalls his father’s stage name, “Jinks” which played a ghostly role in the creation of this album. That name, like all the inspirations, emotions and experiences has returned to haunt the band – this time delivered with a lustrous and magnificent black sheen.